Native to the Mediterranean but now cultivated across the globe, rosemary is derived from the Latin word Rosmarinus , meaning “dew of the sea”. Known for its pleasing fragrance, rosemary also offers a host of medicinal uses that range from preventing age-related memory loss to treating sunburn. A fairly delicate looking plant, rosemary is an evergreen shrub, belonging to the mint or Lamiaceae family. The leaves of the plant closely resemble small pine needles, with the bush reaching up to five feet in height. During warmer months, rosemary produces small aromatic flowers that may be white, pink, purple or blue in color. Some early research shows that in essential oil form, a recipe of rosemary and other herbs including lavender and thyme is beneficial for hair growth. 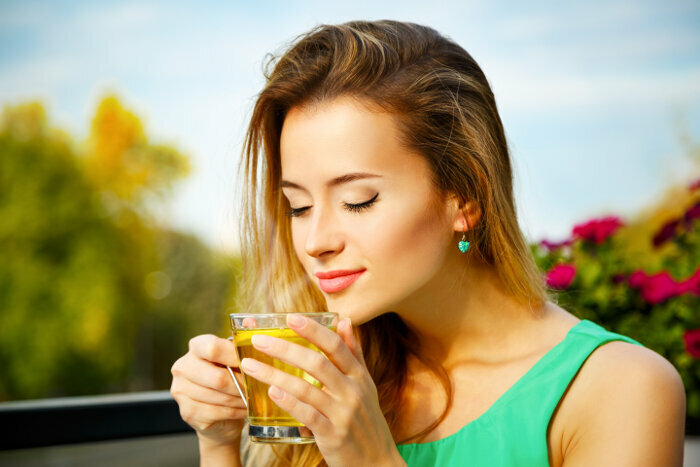 In tea form, a hair rinse can be made with fresh or dried leaves, providing a healthy boost to the scalp and stimulating new hair growth due to the presence of ursolic acid. With a deep and potent flavor, rosemary tea is reminiscent of both the forest and sea. Significant pine overtones are subtly offset with a slight hint of lemon and mint. As fragrant as it is healthy, rosemary is wonderful as a base for other teas or as as the main attraction. Because human smell and taste are so closely linked, rosemary is a wonderful aromatherapy tea. Like many members of the mint family, rosemary possesses generous healing properties, as the herb is an eco-rich source of phytochemicals such as camphor, flavonoids, tannic acid and limonene. Aromatherapy benefits – Studies show that rosemary is a useful and powerful aromatherapy tool, particularly in providing relief among individuals who struggle with chronic pain (Drugs.com). Anti-pathogenic agent – The University of Maryland Medical Center reports, that rosemary has been shown to inhibit food-borne pathogens that cause illness or death in severe cases. This includes Listeria monocytogenes, B. cereus, and S. aureus. Antioxidant effects – Rosemary in rich in antioxidants that scavenge free radicals, rosemary provides powerful protection against oxidative stress (aging). While not as strong as green tea, rosemary provides more antioxidant power than vitamin E.
Anticancer activity – Numerous studies have been done on the effect of rosemary on cancer cells, showing that the herb induces an anti-carcinogenic enzyme. The National Institutes of Health report, “Rosemary extracts and the active compounds carnosic acid and rosmarinic acid have been found to inhibit the proliferation of various human cancer cell lines.” This includes myeloid leukemia, breast cancer, small cell lung cancer, liver and prostrate cancers. Considered a qi herb in Traditional Chinese Medicine, rosemary is a pungent fire herb used to strengthen the spleen, lungs and stomach. In Ayurveda, rosemary is considered a “must have,” belonging in every medicine cabinet. In dried, powdered or leaf form, rosemary is an abundant source of bioflavonoids, retinoids and carotenoids, as well as potassium and dietary fiber. 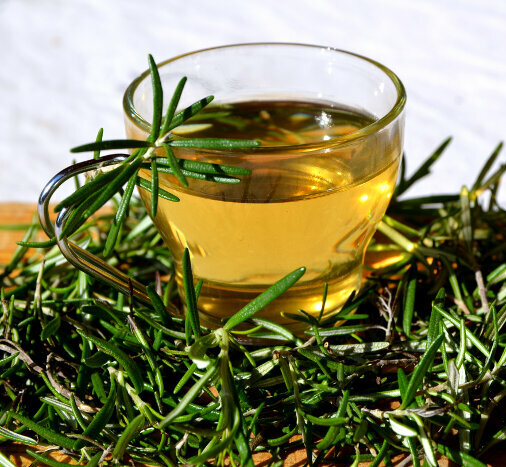 Also rich in B vitamins and folate, rosemary tea is nutrient dense, protecting the body from a plethora of illnesses. Although rosemary has been used for centuries, it was recently approved by German Commission E for daily use, making rosemary one of the first herbs to be accepted by mainstream medicine for its healing properties. Are There Any Side Effects from Rosemary Tea? Pregnancy and breastfeeding – Rosemary can potentially stimulate a miscarriage when taken in medicinal amounts. Pregnant women should rosemary tea or use rosemary in food amounts. Not enough information is available regarding the effects of rosemary on nursing infants, meaning it is best for breastfeeding women to avoid use. Prescription Medications – There are no known drug interactions with rosemary (WebMD). Aspirin allergy – Containing a chemical called salicylate, rosemary is similar to aspirin. People allergic to aspirin should avoid rosemary in any form. Seizure disorders – Rosemary should be avoided by people with seizure disorders, as it may worsen this type of condition. Bleeding disorders – Rosemary may increase the risk of bleeding among individuals with bleeding disorders. Avoid or use rosemary with extreme caution. Typically rosemary daily intake levels for the treatment of conditions such as high blood pressure and rheumatism are four to six grams per day. If using powdered tea, one and a half teaspoons is an average dose. Medicinal amounts can vary, but rosemary is considered safe for most people when consumed in food and medicinal quantities. Bring water to almost boiling and add one and a half teaspoons of powdered tea or dried tea leaves. Allow to steep for five to ten minutes, depending on desired potency. When using fresh rosemary, one sprig steeped for five minutes provides a flavor enjoyed by most people. Steeping for ten minutes is recommended for medicinal purposes, but the flavor is much stronger. As one of the most well known herbs, rosemary tea is readily available in organic and health food stores. Popular brands of rosemary tea include Traditional Medicinals Herbal Teas, Nature’s Tea Leaf, The Republic of Tea and Alvita Herbal Leaf Tea. With no significant adverse health effects, rosemary tea can be added to almost anyone’s daily diet. Statistically, American males have a 43 percent chance of developing cancer during their lifetime, while females have a 37 percent chance, according to current data from the American Cancer Society. While more studies are needed, rosemary shows a great deal of promise relating to cancer protection, making it an essential dietary staple. With such a rich fragrance and deeply permeating flavor, rosemary is a “go to” tea year round. Combined with chamomile and mint, it provides a relaxing effect on the digestive system, is calming before bed and is light on calories – great for the waist line. Mothers used to hang rosemary over the cradles of their babies to prevent fairies from stealing them in the night. Rosemary was a considered to be a sacred herb in Egypt and Greece, with many images of Aphrodite being portrayed with the herb. In addition, a common Christian belief was that rosemary thrives only until it reaches the height of Christ, but it stops growing on the 33rd year. In England, it was believed that rosemary grew well only in gardens where the mistress of the house ruled the roost.